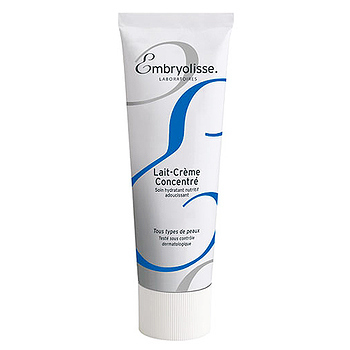 Embryolisse Lait-Crème Concentrè (24-Hour Miracle Cream) is a rich moisturizing lotion. This specially formulated lotion is quite versatile; throw it in your travel bag when you don't have enough space for numerous products. Embryolisse Lait-Crème Concentrè (24-Hour Miracle Cream) is really three products in one: the make-up artists use it as a primer, moisturizer, and make-up remover. It also reduces irritation after shaving! It is a cleansing and moisturising cream that combines emulsifying and softening agents with active moisturisers while respecting the skin's natural balance and encouraging the rebuilding of the hydrolipidic layer. For All Skin Types.